I also stuffed a brand new pair of unworn unides but since this post is already sounding a bit like a pity party lets all move on shall we? We had a house full of visitors all weekend. Aside from my parents, we had a very special visitor come to stay on Friday night for the first time in a while. We had a camp out in our bedroom and everyone knows when you have a camp out you have to have a fire. I was a bit dubious about setting a camp fire on top of my carpet so we improvised. Unfortunately Kevin the sock monkey got too close to the fire at one point and we had to render first aid. On Saturday Little P chose hanging out at home over going to the movies. 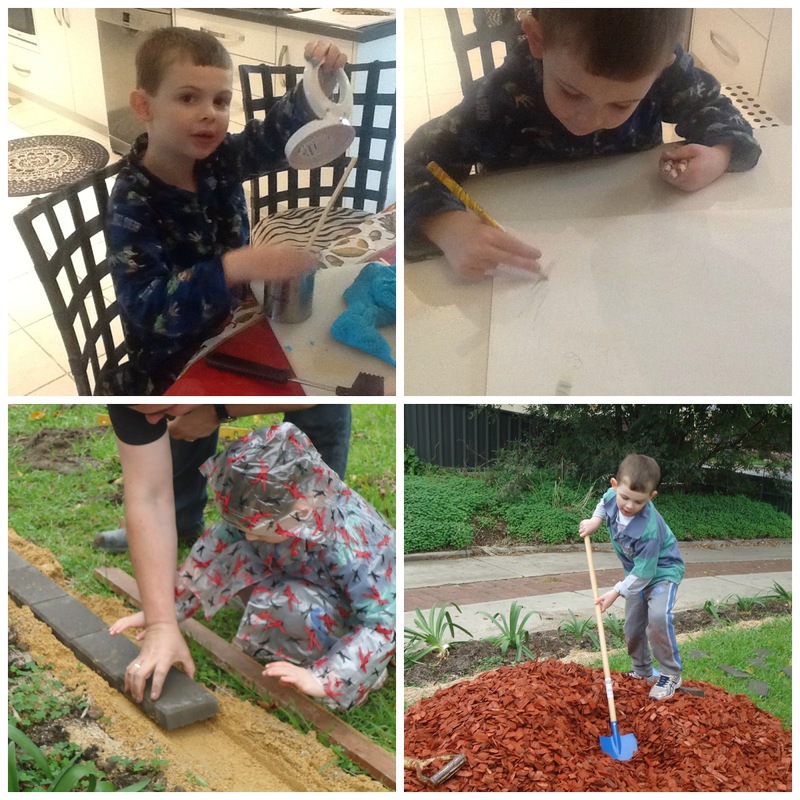 We baked some chocolate chip cookies (no pictures -since they all got eaten rather rapidly), blew some bubbles, made playdough, did some drawing, and then did some gardening. I know you already know this - but this kid is the light of my life. I love seeing the world through his eyes. His enthusiasm for life is positively infectious. The week before last I won a giveaway over at Rachael's blog (Blue Mountain Daisy). I kept waiting and waiting with increasing excitement for it to arrive, checking the post box every day. I mentioned to Mr. P last Monday that I was waiting for parcel and he sheepishly went out to his car and brought in a package that he told me had arrived Friday but that he forgot to give me. Talk about hitting the motherlode-A huge parcel of awesomeness! Thankyou Rachael. I dont know what to use first but trust me - I'm going to have fun playing with all of this loveliness. Hope the car is fixable. Glad you had your grandson over to enjoy the little everyday ordinary things in life. Looking forward to seeing the new quile revealed! I sit here reading your post having abandoned the leave for work thing replacing with the waiting for the RACV man to arrive and see if he can make my car start thing - and it was serviced with major parts replaced two weeks ago! Solidarity sister!! Bugger about the jeans and undies though, it's always the favourites and/or the new isn't it. I was wondering how Little P was faring recently...and he looks to be faring very well, not a teeny little kid anymore, look at him wielding that rake! Cool prize, have fun with that - as I'm sure you will. I'm loving those Seville blocks and the new project fabric - yum! Hope this week goes better. PS. Mr P really needs to pull up his socks, I'm seeing some major fails on his part here - not giving you a prize parcel!!! Really!!! Little P is a doll. So happy the campfire wasn't a killer. Too funny! What a grand time he had with Bella. Congrats on the win and the progress on something fabric filled. Uggh! I hate car troubles. Looks like good times with Little P.:) Enjoy your winnings! So how is Mr P? Fully recovered from the effects of the death stare(s)?? ....so pleased you got to spend some time with little P...love the camp fire! As if the car being broken wasn't bad enough then you hit me with the jeans and the undies malady! I have a fave pair of jeans that had a broken zip....then I found an amazing local person who fixes stuff like that....because I tend to not "do" zips if I can help it....$8 later and I have my fave jeans back....a win I think! Hope you have an awesome week...we must catch up soon! Car problems are the worst because I don't have a clue about them. I hate that 'stupid' feeling I get whenever there are car problems. But I hope your surprise package and little visitor more than made up for the car. I love your fire improv and the idea of an indoor campout. That's my kind of camping, one with an indoor bathroom less than 10m away. I'm a bit worried about that sock monkey though - he seems to have go-go-gadget arms! Oh Little P is getting so big! Sorry About the car and the zip been there a few times myself! Why is it that men think we do not know when something is wrong with the vehicles we drive. I had much the same happen a few years ago and of course Harvey never believed me....until it happened to him. I can hardly wait to see the finished quilts. I love the colours you are going to use in your new design. Mr P sounds like he is in big trouble- the car and the happy mail! Bummer about the car! And the jeans and undies......they say things come in threes, so there you are.....goodness, isn't Little P growing fast! He will be a teenager before you know it. What a week...thank goodness it was save by your visitor and your fabulous prize! Ohh If I was there I'd pounce on those jeans and use them to make a quilt. How do you stuff a brand new pair of undies? That is so annoying about the car. It's quite a unnerving feeling seeing your car being towed away. I hope the mechanic fixes it this time. Sounds like lots of fun times with little P. It's great to see you got some sewing done. You look very organised with the pieces in plastic bags. I apologise, I've been laughing at your expense! Bummer about the car, though that's obviously been coming for a while, hope you made Mr. P pay for that. How cute is little P? Glad you got to have some fun with him this week. Pretty fabrics to play with there. Enjoy. I cannot stand car problems! Very frustrating. Mr P should be happy he can still live with you I think :). 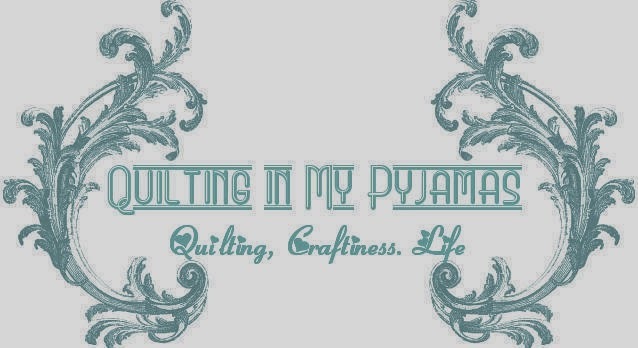 Cannot wait to see the new quilt! Sorry to hear about your car, it's a real pain when that happens. I'm sure you can save your jeans though, one way or another. Even worse if you rip them ! Your grandson is a real cutey and I love your idea for the camp fire. oh my, Little P has gotten taller!! and the car, well ... it's a car and the dang things crap out all the time. Car problems are the worse! But to lose your favorite pair of jeans in the same week, horrible!I feel for you! I'm so jealous of others who have grandchildren. I can't wait to have a few of my own and spoil them in much the same ways. Glad there were some ups to your week. Take care! You have been busy! Sorry about your car and jeans - at least your fire wasn't like mine! Cars and blokes, both will bite you on the arse. Mr P was clearly having an off week. Fancy risking bodily injury by not giving you that parcel as soon as it arrived, don't know what he was thinking. Awesome win though! First question. Is Mr P still alive? Little P is growing up, so wonderful to see you are still having such fun with him. I'm sure he loved his time with Bella. How's the car? Sorry to hear about your brand new undies and jeans. Lucky you wear pj's most days! Oh and I forgot to mention, thank you so much for not showing a full pic of the sock monkey, blerk! Well I hope after all that Mr P is well and truly stuffed in the dog house! You know it's possible to salvage those jeans & fix the zipper. Hope you didn't toss them. There's a tutorial out there somewhere showing you exactly what needs be done. I am thrilled to see Little P gracing the pages of your blog. My oh my! He sure has grown. Gone from toddler to boy in one fell swoop. Sounds as though you had a fabulous time. Transmission repairs are really tricky. Most of the time the mechanics get it right, but there are some instances where it seems there some more other issues that the mechanics must have not seen. Assuming that the first repair already fixed some part of your transmission, probably another part needs fixing and this is the one they should look at. This should be of no worries to an adept mechanic, as they will probably check the parts individually to get everything in one go. I hope they get your car repaired! Looks like lots is going on at your place, as usual! Can't believe how big that cute grandson of yours is! Love, Love, Love the Hexie quilt! Major car problems are no fun. Hopefully it's a quick fix (won't mention cost, because that's another no fun thing about car problems). Wow, Little P isn't so little anymore. They grow up so fast. Sounds like a good time was had by all. Mr P should have been suitably sheepish after two major stuff ups in a week? So glad you got to have Little P over. Is he 5 now?